We meet at Carrows Restaurant in Ventura (2401 E. Harbor Blvd. near Seaward) on the 4th Wednesday of each Month except Nov and Dec.
Join us for our monthly car cruise and other events that we participate in all year long. Guests are welcome! 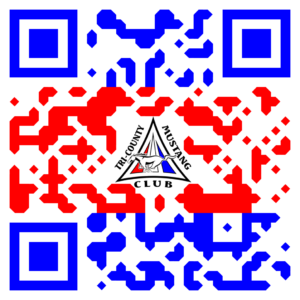 We are the Tri-County area’s longest running Mustang club and we’re always growing. Whether you own a Mustang or you are simply a Mustang enthusiast, come to one of our meetings or monthly cruises. We have a ton of fun and would love to meet you! Each October, at the Channel Islands Harbor in Oxnard, CA with over 100 Mustangs from rare classics to the latest Mustang models! The Tri-County Mustang Club is a fun, casual place for people of all ages in Ventura and surrounding Counties to meet and share their love of the Ford Mustang. All model years are welcome! 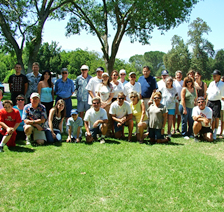 We get together each month for meetings, cruises, brunches, car shows, picnics, parades, and other special events. Our annual Ponies by the Sea Car Show is held in October of every year, which benefits the Guide Dogs of America. Our biggest event of the year is the Ponies by the Sea Car Show, now in our 33rd year. This show has attracted 100+ cars. This show benefits the Guide Dogs of America (GDA) and the Club contributes all net proceeds to GDA. And this year it is sure to be even better! 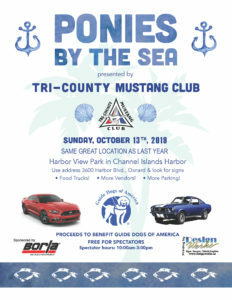 The Ponies by the Sea Car Show is going to be at CHANNEL ISLANDS HARBOR again this year, on the grass and right next to the water. We are excited that the show will have space for participants to park on the grass, spectator parking, sponsor booths, and popular food trucks!. All Mustangs and Ford powered vehicles are welcome to enter. Watch for a new flyer!